Would you throw on a brand spankin’ new outfit without bathing first? Of course not! So why would you apply makeup without washing your face? Cleansing your skin is the first step to radiant skin. And the easiest. Washing your face morning and night is important. Cleansing removes all of the dirt, oil and pollutants your skin absorbs everyday just from walking outside. The result? Clean, clear skin that’s ready for a flawless makeup application! I know you’re probably thinking, “Oh no! I’ve been letting my skin collect so much gunk!” Maybe. However, it’s still in your best interests not to over-cleanse your skin. Washing your face morning and night is more than enough to remove bacteria and impurities without stripping your skin of its natural oils. You also want to use the best cleanser for your skin type. This ensures that you’re nourishing your skin with the right ingredients to keep it balanced, even and radiant. If you’re oily, a lightweight, mild foaming cleanser will work well at keeping oil at bay without stripping your natural oils so your skin doesn’t overcompensate for it later. On the other hand, if your skin is more dry, you’ll benefit most from a creamy, hydrating cream, balm or oil cleanser. Stuck in the middle with dry and oily spots? Then you’ll do best with a gentle gel based cleanser for a light lather or a cream cleanser if you’re feeling a little more dry. Now it’s time to moisturize! Whether you’re bone dry or an oil slick, your skin needs a moisturizer to stay hydrated and look smooth, clear and radiant. Making sure to slather on a little moisturizer before you leave the house will block some of those nasty environmental impurities and helps to keep your moisture barrier in tact so your skin always looks smooth and plump. Applying makeup without moisturizer can leave skin looking dull, flaky and even oily. You don’t want that! People often skip moisturizer but it’s one of the most important steps of any skincare routine. It’s basically a little jar of magic spackle! Moisturizer deeply penetrates the layers of your skin to helps to fill in the dry “gaps” of your skin resulting in a smoother, softer and overall improved appearance. Once you begin to use moisturizer regularly, you’ll begin to notice that your skin feels and looks a lot better with a healthy, radiant glow. Like cleanser, moisturizer isn’t a one size fit all kind of deal. It’s extremely important that you choose the best moisturizer for your skin type! Choosing the wrong moisturizer can result in your skin working overtime to get what it needs which often causes funky breakouts. For oily skin, a lightweight water-based gel moisturizer or oil control lotion is a great option for keeping skin hydrated, balanced and slick-free. Dry skin requires a little extra moisture since it shows signs of aging sooner. Rich creams, balms and oils work best for dry to extra dry skin to keep the flakes away. Combination skin can benefit from using either rich moisturizers or more lightweight moisturizers to keep dry areas hydrated and oily spots from getting a little too shiny. Doesn’t it feel good to treat yourself after a long week? Well, your skin could use a little treat too! Believe it or not, your skin works just as hard as you do to keep you looking your best. Even when it doesn’t always seem like it! Blemishes, enlarged pores and even dark spots are sometimes your skin’s way of asking for a little help and extra TLC. Pamper your skin with a mask or scrub to give your skin the extra boost it needs to be healthy and radiant! At least once a week, be sure to give your skin a deep scrub or a good mas. This helps keep your skin in tip top shape. Your skin is constantly working hard everyday to produce healthy new skin cells. If you don’t treat your skin, all of that hard work goes to waste and those fresh, new skin cells start to become dry, dull, inflamed or even worse. That’s why it’s important to go the extra mile every now and then to refresh your skin and address those pesky skin concerns. You’ve the basics. Now it’s time to put it all together! 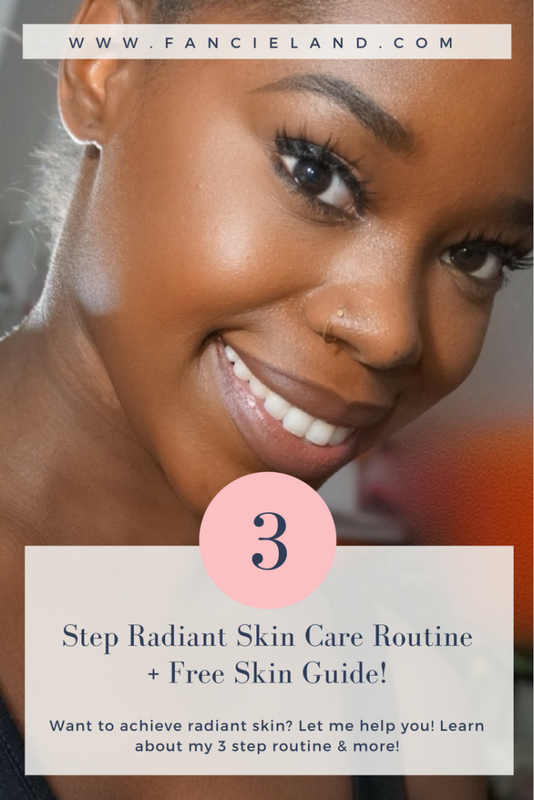 Learn how to assess your skin type, pick the best formulas for your skin and more with my FREE Radiant Skin Guide! You can download it here.